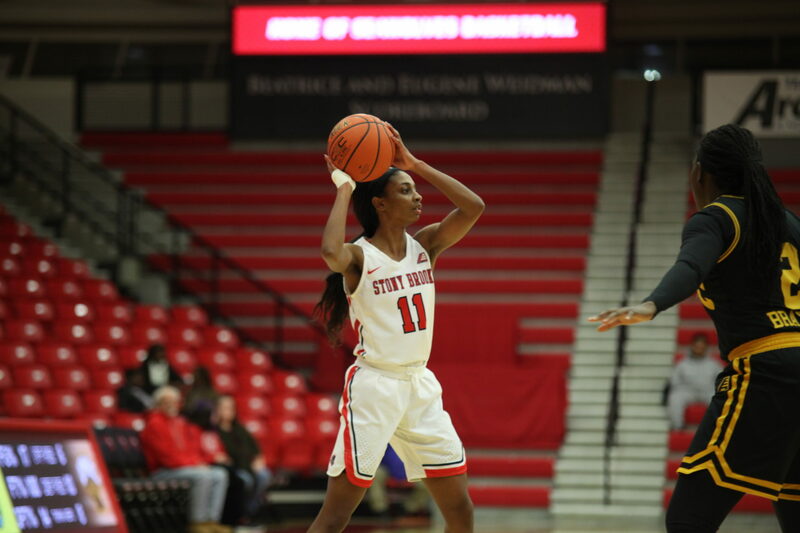 Riding a hot streak coming off two consecutive victories, Stony Brook Women’s Basketball looked to exact revenge against the Hartford Hawks on Saturday, Feb. 2. The Seawolves dropped their conference opener the last time the two teams faced off in a 64-36 Hawks routing exactly one month ago. Despite Stony Brook putting up a closely-fought first half, Hartford pulled away with a strong third quarter and beat the Seawolves 73–62, sweeping the regular season series. The Seawolves fell behind early, yet ended the first quarter on a 14–3 run, taking an 18–13 lead that was capped by a 3-pointer from senior guard Shania “Shorty” Johnson. Both teams traded buckets in the second quarter, with the lead never growing larger than four. Sophomore forward India Pagan was fouled as the half came to a close and sunk both free throws, giving Stony Brook a 32–31 lead at the end of the frame. Hartford came out of the third quarter blazing hot, going on a 17–3 run and taking a 48–35 lead with 3:10 left in the third. Stony Brook shot 1-for-9 and committed four turnovers during the run; the team only shot less than 22 percent in the entire quarter, compared to Hartford’s shooting percentage of over 56. The Hawks outscored the Seawolves 23–9 and carried a 13-point lead as the quarter ended. It was a hole that Stony Brook could not come out from. While the two teams continued scoring back and forth, the Seawolves never cut the deficit closer than eight. Hawks sophomore guard Jade Young led all players with 21 points, while also leading her team with eight rebounds, four assists and two blocks. Senior guard Jerell Matthews led the Seawolves with 16 points and three steals. Despite the loss, Stony Brook continued dominating the boards with a plus-15 rebound margin, out-rebounding the Hawks 40–25. With an average of 38.5 rebounds per game, Stony Brook leads the entire America East conference in that statistic. The Seawolves average 5.9 more rebounds than their opponents, one of only three teams in the conference with a positive rebound margin. However, Stony Brook fell victim to Hartford’s strong defensive play and turned the ball over 26 times. Hartford entered the game with over 24 takeaways per game – the most in the conference and eight more than second place. The matchup between the top two defenses in the America East ended in Hartford’s favor. With the loss, Stony Brook fell to 16–6 and 5–4 in America East Conference action. Stony Brook will look to rebound from Saturday’s loss when the Seawolves take on the Binghamton Bearcats at home on Wednesday, Feb. 6. The game has been designated as the team’s annual Pink Game, which supports survivors and raises awareness for breast cancer. The contest will start at 7 p.m. in the Island Federal Credit Union Arena.